Got a consumer electric pressure washer? 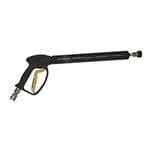 If it's a Karcher, check the Features tab on Karcher spray gun pages to make sure your model number is listed. 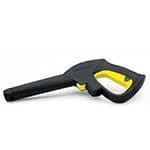 Karcher has made many different spray guns over the years. Be sure you choose a replacement that is compatible with your unit. 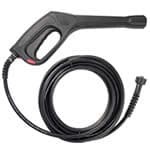 If it's another brand up to 2000 PSI, then the Powerwasher Universal Replacement Gun w/ Hose is a versatile option. It features adapters for various lances and brushes to be compatible with various brands. It also includes a Karcher bayonet adapter. It does not include a nozzle or wand however; so if those are things you need, you'll have to purchase them separately. Got a consumer-grade gas pressure washer with threaded, M22 fittings? 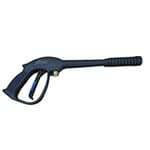 MTM Hydro Front Entry spray gun is a good option in most cases. It connects with the very common M22 connector via a male connector located in front of the trigger for ease of use. There are also various types that work with specific makes and models, so this isn't your only option. Got a professional grade pressure washer? Check for either threaded M22 or quick connect attachments. Hot water pressure washers need a spray gun that specifically says it can be used with hot water. This is because hot water pressure washer guns have high temperature seals that won't melt. Pressure Washer Spray Gun Buyer's Guide.. Our Power Equipment Direct how-to library can help you learn about Proposition 65 Product Labeling, Sales Tax Information and Product Recalls for Pressure Washer Equipment.